Besides credit qualification barriers due to low FICO scores, there are two barriers to originating more loans and selling more houses to owner occupants: (1) insufficient down payment, and (2) increasing loan costs. The FHA still originates loans at 3.5% down, and the credit barriers are limited, despite realtor pleas and rhetoric to the contrary. However, since the FHA is losing a great deal of money and facing a bailout, they are continually raising their insurance fees as they become the replacement for subprime lending. These increasing costs are making houses less affordable and thereby reducing access to credit. As a result, many borrowers are opting for conventional mortgages with their higher down payment requirements. And since fewer potential buyers have the available cash saved for a down payment, the increasing costs of FHA loans which drives people to conventional mortgages is further reducing the buyer pool. This will inevitably lead to less demand. A recent survey from the National Association of Realtors recent survey shows that with a recovering housing market and more borrowers choosing higher down payment conventional loans versus FHA loans… . The high cost of FHA loans is clearly driving buyers away, and it will only get worse. Of the surveyed homebuyers, 87% used a mortgage for the purchase. Typically 91% of the home was financed, requiring a 9% down payment. … With tighter credit standards than before, homebuyers are different than in years past. Married couples comprised 65% of recent homebuyers, the highest share since 2001. When married, couples hold the advantage of more buying power and added financial stability, in addition to higher household incomes. The average down payment is only 9% nationally, and 87% used a mortgage. Those numbers reflect just how weak the recovery is. If down payment requirements go up — which they likely will when the Dodd-Frank qualified mortgage requirements are finalized, the buyer pool will get squeezed even further. Despite the fact that about 30% of homeowners have no mortgage, those aren’t the people buying today. Nearly everyone is borrowing money to buy homes which makes the housing market vulnerable to changes in lending costs and requirements. And it’s likely these requirements will get stricter, and costs will go up due to huge losses at the FHA. The Federal Housing Administration, which ended fiscal year 2012 with a $16.3 billion insurance-fund shortfall, will raise premiums and sell delinquent loans to avoid taking aid from taxpayers for the first time in its 78- year history, agency officials said today. The FHA has no choice. They operate on the subprime lending model subject to high delinquency rates. In a declining or weak market, that translates into large losses. In order to cover the costs of these losses, they must either get a massive bailout or raise their fees. Should we pretend to be surprised by this? The report’s negative outlook set off a renewed debate among federal lawmakers over the proper role of government in the U.S. housing market. Yes, it has. The FHA should not loan to Ponzis to reenter the housing market. Republican members of Congress responded today with calls to shrink the government’s footprint. Together, the FHA and U.S.-owned Fannie Mae and Freddie Mac guarantee more than 90 percent of U.S. home loans. The Republicans are right on this issue. Democrats defended the agency’s historic role enabling low- income families to purchase homes with low down payments.“At a time when the private market constricted, FHA stepped up, providing crucial liquidity and access to the mortgage market,” Representative Maxine Waters of California, a Democrat on the Financial Service Committee, said in a statement. The FHA has historically played the role of lender-of-last-resort, and perhaps there is some value in this. The housing collapse would have been twice as brutal without the FHA. Much of the Republican posturing ignores the inconvenient fact that the FHA saved their campaign donors — the too-big-too-fail banks — greatly benefited from the FHA absorbing these losses. Senate Banking Committee Chairman Tim Johnson, a South Dakota Democrat, said he was “deeply concerned” by the actuary’s findings and would call Secretary of Housing and Urban Development Shaun Donovan to testify at a hearing after the U.S. Thanksgiving holiday. Is finding a scapegoat the solution? Both sides are disingenuous, and they need someone else to blame for the policies they put in place. Politics as usual. Most of the FHA’s new revenue-generating policies will go into effect in January. The annual premium FHA charges borrowers in return for guaranteeing loans will rise by 10 basis points on new mortgages, an average cost of about $13 per month for borrowers. The agency also will no longer allow some borrowers to stop paying premiums after 10 years. This won’t likely be the last increase in FHA insurance premiums. The fund has not turned the corner on delinquencies or their associated losses. FHA will provide deeper levels of payment relief for borrowers who receive loan modifications to avert foreclosure. In addition, FHA will expand short sales and continue auctioning off at least 10,000 delinquent loans every quarter, urging investors who buy them to take steps to keep families in their homes. Those policies will only worsen the losses on FHA loans. FHA Acting Commissioner Carol Galante declined to speculate on whether these measures would be enough to keep the agency from seeking Treasury assistance. More than 17 percent of all FHA loans were delinquent in September, according to data on the agency’s website. The agency has lost $70 billion on loans it insured from fiscal years 2007 through 2009. The report blames the fund’s losses largely on loans in which sellers were allowed to cover the down payment on behalf of the buyer, often by inflating the price of the house and reducing equity for what may been an otherwise unqualified buyer. Congress banned the FHA from backing such loans beginning in 2009. This policy change was greeted with howls of protest from homebuilders and realtors who decried the loss of business. Both groups obviously don’t care about taxpayer losses as they lobby for their own selfish ends. For the agency’s 2012 report, its actuary changed the economic modeling to include less-optimistic home-price projections and a revised assessment of loans from earlier years that have been refinanced more recently. The previous reports were a charade intended to deflect criticism until after the US election. Now that Obama is back in office, we can deal with the problem everyone preferred to ignore. Rising costs of FHA loans will make those loans less desirable, and they will reduce the overall buyer pool able to afford homes. This will hurt the housing market. Will it reverse the so-called recovery? I don’t know, but it certainly won’t help. We wouldn’t have this problem if realtors didn’t convince sellers there is a difference between a market-rate distressed sale and a market-rate equity sale. Both are market-rate sales. The sellers motivations are irrelevant. When Cris Robinson put her Rancho Santa Margarita townhouse on the market earlier this year, she noticed that the only nearby homes selling were foreclosures and short sales. “There wasn’t a single standard sale to (compare) me with,” said Robinson, an equity seller. Robinson said a buyer offered to pay $317,000, but the appraisal came in at $310,000 – the price at which another home in the neighborhood recently sold. That townhouse was the same model, Robinson said, but it was distressed and needed work. By contrast, her own place had thousands of dollars in custom upgrades, including travertine floors. A homeowner looking askance at an appraisal is nothing new. But many Realtors also complain that lowball appraisals are hurting home sales. The National Association of Realtors says a recent survey indicated that in some cases appraisals are lagging behind the recovering housing market. Appraisers aren’t always familiar with neighborhoods, and some use foreclosures and short sales as comparable sales without adjusting for them. Real estate agents note that the low inventory of homes for sale – in Orange County and across the nation – has created bidding wars for many homes, pushing prices higher than recent comparable sales. In the national survey in September, 1 out of 3 Realtors said they had problems relating to home appraisals in the previous three months. Eleven percent of them said a contract was canceled because an appraised value came in below the price negotiated between the buyer and seller; 9 percent reported a contract was delayed; and 15 percent said a contract was renegotiated to a lower sales price as a result of a lower appraisal. Appraisers say they don’t set the value of a property, they reflect it. They say neither real estate agents nor homeowners are trained to appraise homes. A nationwide appraisers’ professional association, meanwhile, cites problems in the way appraisal management companies are assigning and paying appraisers. The appraisal management companies contend that their role is misunderstood. Appraisers say they are the only people involved in real estate transactions who don’t have a stake in the price of a property or whether it sells. “We’re there to protect the public trust,” said Sara W. Stephens, president of the Appraisal Institute, the nation’s largest association of real estate appraisers. Five mortgage servicers have provided over 300,000 borrowers with some form of mortgage relief as part of a settlement agreement, according to a report from settlement monitor Joseph A. Smith, Jr.
Bank of America, Chase, Citi, Wells Fargo, and Ally reached a $25 billion mortgage settlement with state and federal officials in February 2012 over foreclosure practices. The agreement requires the banks to provide $20 billion in relief, but the servicers are not always credited on a dollar-for-dollar basis. Thus, the gross amount of relief actually provided will be higher than what is credited. As of September 30, 2012, banks reported they have provided $26.11 billion in actual consumer relief, which represents a value of $84,385 for each assisted borrower, according to the monitor. The report explained some principal forgiveness on loans both owned and serviced by a servicer is credited on a dollar-for-dollar basis, but forbearance activities provide a credit of 5 cents for every dollar. Smith added the information provided in the report “cannot be used to evaluate progress toward the banks’ $20 billion obligation” since it represents the gross amount. While servicers can receive credit through a variety of forms of relief, at least 60 percent must be through first and second lien principal reduction modifications and no more than 10 percent can be deficiency waivers. Servicers also have three years to meet the minimum relief requirements, but they are being encouraged to offer relief sooner through additional credit. If servicers provide first or second lien principal reductions or provide credited refinancing activities, they receive an additional 25 percent credit if the relief is completed by March 1, 2012. Bank of America recently announced that it anticipates fulfilling consumer relief requirements in the first year. If servicers don’t complete their requirements within three years, they will pay 125 or 140 percent of their unmet commitment amount. Out of the $26.11 billion, $2.55 billion is from principal writedowns through first lien modifications, while $2.77 billion comes from second lien forgiveness or modifications. The majority came from short sales, $13.13 billion. Another $1.44 billion went towards refinancing. As part of the agreement, servicers also had to implement more than 300 servicing standards by October 3. Short sale debt forgiveness is a huge chunk. Does anyone know if the banks are being allowed to include in their “relief” numbers forgiveness of the short amount in short sales where the bank had no right to collect the short amount? From what I understand, they get to count short sale losses on their holdings as well as losses on MBS pools they service. I’m not sure, but I think this also includes second mortgages and HELOCs. Very low interest rates may be having the effect Bernanke is after. Home sales saw a substantial surge in October, according to real-time data from technology-powered real estate broker Redfin. According to Redfin’s Real-Time Home Price Tracker for October 2012, home sales increased 9.8 percent across 19 major U.S. markets from September to October, an unusual gain in a month that commonly sees monthly declines of at least 5 percent. Compared to October 2011, sales were up 21.8 percent. While October’s increase was unusual, it was not unexpected. According to Tim Ellis, blogger and analyst for Redfin, the company’s Real-Time Demand Pulse for September predicted an increase in sales volume based on the number of customers requesting home tours and writing offers the previous month. Unfortunately, the Real-Time Demand Pulse for October showed a decline in home tours and signed offers, leading Redfin to predict a slowdown in sales to close out the year. Meanwhile, the share of new listings that went under contract within 14 days bumped up two percentage points to 28.2 percent, its highest level since May. At the same time, the market so no relief as far as inventory concerns. According to Redfin, the total number of homes for sale was down 29.4 percent in October compared to a year earlier, dropping to less than 200,000 total listings across the 19 metros covered in the report. Prices also increased in October, though on a more modest scale. The tracker reported price increases of 8.4 percent year-over-year and 0.4 percent month-to-month. Seventeen cities reported higher prices than a year earlier, two more cities than in September. Fourteen of the 19 metro areas measured posted increases from September, up from only eight in the previous report. According to Redfin CEO Glenn Kelman, October’s price increase is the result of basic economic theory. “With supply low, and the economy slowly improving due to record-low interest rates, demand has increased,” Kelman said. “Household formation is now at a record high. High demand and low supply drive prices up. 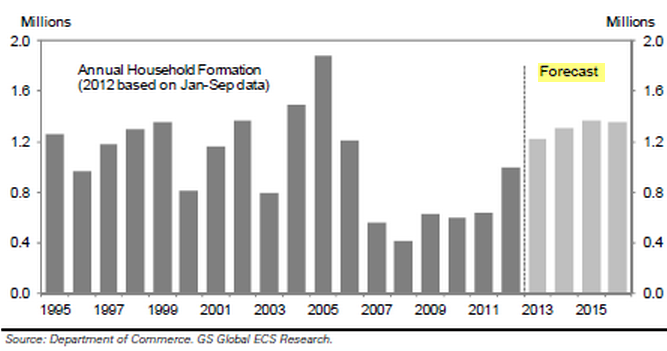 “Household formation is now at a record high” ?? Builders are really enjoying the lack of MLS inventory. Builder confidence continued its march to “break-even,” with the Housing Market Index (HMI) climbing five points in November to 46—its highest level since May 2006—the National Association of Home Builders (NAHB) reported Monday. Economists had expected the index to edge up one point to 42. The HMI survey was conducted in the two weeks immediately following Hurricane Sandy and therefore reflects builder sentiment during that period. The November boost was due primarily to a surge in current sale activity—which should be reflected in the government’s new homes sales report to be issued next week—which rose from an index level of 41 (revised down from an originally reported 42) in October to 49 in November. The current sales index is at its highest level since March 2006. The upward assessment of homebuyer activity followed a five-point boost in buyer traffic in October. The traffic index remained at 35 in November, and the outlook for sales six month out rose by two points to 53 in November—its highest level since February 2007. The overall index is up 27 points in the last year, the strongest year-over-year gain in its almost 28-year history. The current sales index has risen 29 points in the last year, also a record. The traffic measure also registered a record year-year gain (21 points), while the index for the sales outlook is up 28 points year-over-year, shy of the 34-point record for an annual gain. Since the same destructive monetary policies that led to the prior housing bust are being extolled for driving today’s marketplace, there really is no point contemplating a recovery. Ah, but the money is even cheaper this time! The damage will be greater. If they start using interest-only loans and Options ARMs, we will inflate a bubble we can’t recover from in our lifetimes. The Sacramento Bee attributes it to the state’s high cost of living. The Golden State’s poverty rate is a whopping 23.5 percent – higher than the District of Columbia, at 23.2 percent, and even Florida, and 19.5 percent. California’s shockingly high number came after the Census Bureau changed how it measures its data. I know California has 1/3 of the welfare payout rolls. Vintage loans brought the Federal Housing Administration’s (FHA) Mutual Mortgage Insurance (MMI) Fund to its knees in fiscal year 2012, but the agency insists it does not immediately need to draw from the Treasury. A review conducted by an independent actuary found that the capital reserve ratio of the MMI Fund fell below zero to negative 1.44 percent, representing a negative economic value of $16.3 billion. The agency also saw losses from the ongoing effect of seller-funded down payment assistance loans. Though the practice was put to an end in 2009, the expected cost of those loans made before that time is more than $15 billion. Low interest rates have also been a problem for FHA. While the overall economy is benefiting, the agency is taking losses as borrowers refinance their loans into lower rates. In addition, those who don’t qualify and continue to pay at high rates are more likely to default. However, in a financial status report issued to Congress, HUD says the agency is not down and out just yet. “This does not mean FHA has insufficient cash to pay insurance clams, a current operating deficit, or will need to immediately draw funds from the Treasury. The need to draw on Treasury funds is determined not by the economic assumptions of this actuarial review but those used in the President’s FY 2014 budget proposal to be released in February,” HUD said. The final determination on a potential Treasury draw will be made in September. FHA also noted the actuary’s estimate of the MMI Fund’s economic value leaves out $11 billion in expected capital accumulation through the end of fiscal year 2013. The fund’s capital ratio is expected to reach positive figures by the end of fiscal year 2014, assuming there is no change in policy or action taken by the agency. Still, the report lays out a series of initiatives designed to improve the health of the MMI Fund and reduce the likelihood of a Treasury draw. Those initiatives include the continuation and expansion of foreclosure alternative programs and an increase on the annual insurance premium paid by borrowers on new FHA loans. The premium increase is expected to add $13 per month for the average borrower, strengthening FHA’s capital position without making credit access tighter. Industry analysts and trade organizations had mixed reactions to the report. Barclays pointed out that while base-line assumptions would put the fund in the black by 2014, a more pessimistic scenario could set the fund’s economic value back until at least fiscal year 2019. The firm also expressed skepticism over whether a raise in insurance premiums will be sufficient to off-set the near-term need for money. LOL! That’s right. It went from $13.5 billion to $16 billion is a couple of days. There will be another report that raise the bailout to a higher dollar amount in February or March. When the government leaks out bad news, you can usually count on the first revelation being about half the final tally. The bailout will exceed $25 billion before its over.